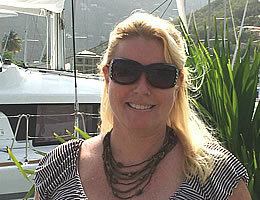 BVI Yacht Charters provides excellent all-inclusive, fully crewed and captain only charters. We have years of experience perfecting ideal vacations for family, friends, honeymooners and corporations. with your itinerary and give recommendations of the places you should visit and don’t want to miss on your vacation. She is looking forward to working with you to plan the vacation of a lifetime! Altesse is a beautiful 2013 Lagoon 560, able to accommodate 8 guests in 4 queen size cabins, or 3 queen cabins and a fun bunk room for kids. In 2015 she went through a full refit with additions such as full dining capability on the fly-bridge with an extra BBQ and dining table installed, enhancements to the interior to give her a sophisticated European twist and a custom built 'champagne deck' which extends the cockpit and offers a unique and hugely popular additional relaxation and jumping area. 2 dives per week for up to 5 divers and gear are included for certified guests. Braveheart is an all-inclusive, luxuriously appointed, well equipped, modern 58ft performance catamaran. She has all of the modern conveniences, such as scuba compressors, water maker, ice machines, wifi, and en-suite a/c with separate controls. The four private staterooms, each with en-suite dry head, electric toilet, and separate shower, and in room entertainment systems, accommodate up to eight guests. There is a single for the ninth guest. Catalyst is an older but budget friendly St. Francis 44’ catamaran. Her 2 queen guest cabin has A/C and ensuite head and shower (with bathtub!). The aft double guests cabin also has an ensuite head and showers but no A/C. Catalyst offers exciting, but stable, no heel, sailing while pampering its guests in comfort. Diving is included for certified divers but guests bring or rent their own gear. Resort course or dive instruction is also available. Free Ingwe is a beautiful 45’ Leopard Catamaran and was launched in late in Cape Town, South Africa. "Ingwe" means "Leopard" in the Zulu language. There are three air-conditioned spacious double guest cabins, each with ensuite walk-in shower and head. Each guest cabin features ceiling fans and 4 window hatches designed to catch and distribute cool ocean breezes. Full night AC is available on guest request for a surcharge of $40 per night. The ultra modern galley is on the same level as the saloon. 5 dives per week are included for certified divers. Good Vibrations is a 62’ Leopard catamaran and had a major refit in 2014! The layout is four cabins - one master queen with walk around bed and three further queen staterooms all with ensuite bathrooms, lots of closets and air conditioning. The salon area has two seating areas, one which doubles as an indoor dining option, all comfortably upholstered in soothing blues. On the right is a well stocked bar complete with inviting bar stools. The cockpit is very welcoming with seating around and an al fresco dining option. Upstairs on the fly bridge is a huge sunbathing pad and forward there are backrests for relaxing in the trampolines. Hypnautic is a beautiful new owner's version Lagoon 44 catamaran with fly-bridge. Hypnautic is luxury defined. Her beautifully varnished woodwork highlights her interior. The master guest cabin takes up the entire starboard side of the yacht with large stateroom, owner's salon and full en-suite facilities. The 2 additional guest cabins are luxuriously appointed with individual air conditioning controls, high definition plasma satellite TVs and DVDs and xm radio with Ipod plug-in stations. The main salon is roomy with wraparound viewing. Sayang is a (2005) luxurious Jeanneau 54’ Sloop. Sayang, which means "Sweetheart" in Malay has lovely woodwork and special attention to details. Fun to sail with, a generous cockpit and easy access to the water. She accommodates six guests in her three fully air conditioned, queen-sized cabins, each with its own head and shower. The two forward cabins can be converted in 1 spacious master cabin. Sayang can start and end in St. Thomas, but gives a $400 discount for charters embarking and disembarking in BVI.